My girl has been an honest-to-goodness kindergartner for a couple of weeks now, so I suppose it's time to post some sort-of-first day photos and some actual first day photos. Her sort-of-first day...the day she went with only half her class. Over the past two weeks, she's been to music class, art class, computer class, the library, and gym. She has eaten lunch in the cafeteria. She has had recess inside on a rainy day and outside either on the blacktop or the playground on all the sunny days. She has successfully gone into school every day since the second day on her own without getting lost. She has had one incident wherein she got on top of a jungle gym and couldn't figure out how to get down and was rescued by "an older boy that's not in my class." She has stopped writing her "S's" backwards, and she has started writing her entire name on all of her papers despite the fact that we never call her by her entire name. She has learned to recite the entire book Brown Bear, Brown Bear, which doesn't sound that interesting until you realize that she's reading it with a serious southern drawl, which is new. The changes? Moving from a lifelong 8pm bedtime to a 715-730 bedtime. Having to have a shower every single day. Waking her up at 630 every morning, which is tough because she's a sleeper, but is amazing because I wake her up by snuggling with her. Planning outfits the night before. Packing snacks and lunches every day. Brushing her hair every day, which she hates preferring a cave girl look. Having to wear shoes all day every day. Being tired. M is in Indiana this week, so it's odd that my day revolved around corn. Stella and I dried corn this afternoon. There was a recipe (directions??) for it in my new book, and since the only thing we eat corn in other than popcorn is Corn and Bacon Soup, I decided to give it a go. Thus, my girl and I sat down this morning to shuck two dozen ears of corn. She gave up when a giant worm ended up in her hand on her first ear. She squealed like she'd been hit with a branding iron and threw the worm halfway across the room. Her role was then downgraded from "co-shucker" to "girl who halfheartedly pulls silks off cobs after her mother shucks them and makes double sure there are no worms left." She also decided during this venture that we were playing prairie girls who were putting up food for our families for the winter. She stacked all the ears of corn on the counter, and when we were done she said, "Look how much corn I have to feed my family during the winter. Where is yours?" After parboiling all the corn, I cut it off the cobs and dried it and dried it and dried it and dried it. The book said it would take two hours. It took four hours for one pan and six for the other. And now we have one quart of dried corn to rehydrate for soup during the long, cold, evil winter. I will say that she has been a great helper during my food preserving experiment. She helped peel all zillion pounds of tomatoes that I canned, and she added the lemon juice to each jar. For now our food cache has 21 quarts of tomatoes, three half pints of strawberry jam (we've eaten two jars since May), four half pints of drunken cherries, and four half pints of dried corn. 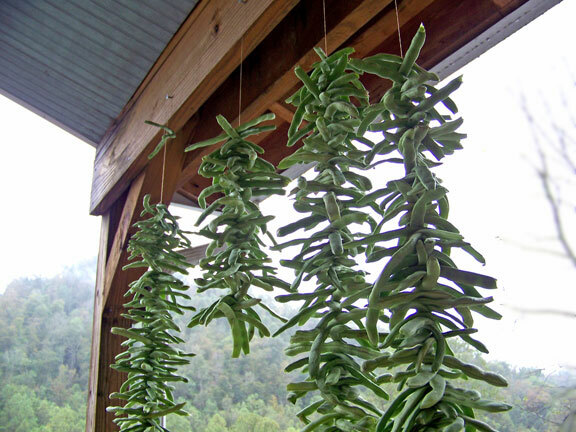 I've also got a pound of green beans strung up in the kitchen drying. They're called leather britches, and with a name like that you know I had to try it. Image from Friends Drift Inn. We're planning to buy a freezer soon, too, because you can barely open and close ours as I'm constantly making and freezing chicken and vegetable stocks, and I loaded the fridge with frozen strawberries earlier this summer. Also, I bet you're wishing I'd just stayed gone because the past two posts have been the opposite of riveting. Now you understand why I've not been blogging. ...who lived at my house. Her name is Me. I realize I've not been blogging, but we're going to ignore that and jump right in. I am an old, old woman. No matter how hot it is outside, and we've had plenty of 100+ days this summer, I almost always have a sweater on in the house. And slippers. I have a head full of prematurely gray hair. At some point in the not too distant future, it will cease to be "prematurely gray" and just be "gray." I'm not there yet, though. I have BURSITIS, which is something for old people, I'm sure. I was having to take arthritis meds, which are just really heavy duty anti-inflammatory pills, but they were making me sick, so I quit. Now my hip just hurts if I sit still too much or move too much or get cold. And I take a lot of Aleve. Did you read what I just wrote about not being able to sit still too long? Because if I do, I groan like an old person upon standing and then have to do some stretching and cracking. Bring on the Chondroitin. I wear pearl earrings like Barbara Bush wears pearl necklaces. 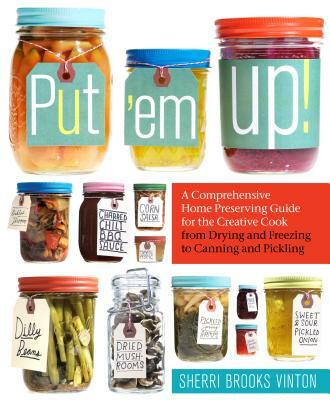 Lastly, and this is my totally new thing that has taken over my life for the past two days, I'm canning. That's right, I'm putting up food for the winter. I canned Strawberry Jam a couple of months ago, but this is a new beast. I'm canning tomatoes. Lots of tomatoes. When I finish with the tomatoes I got yesterday, I'm going to get more. 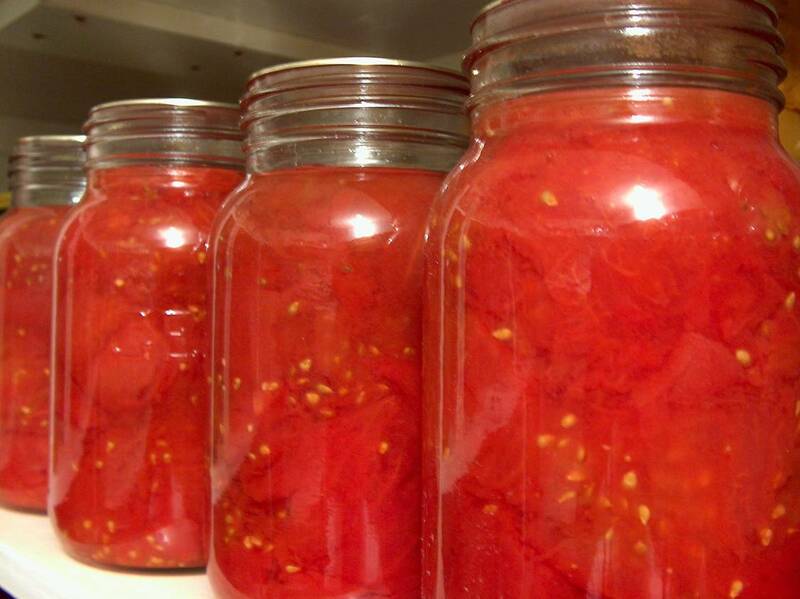 By golly, I'm going to be making fresh pasta sauce and salsa all winter long. I bought a book and everything. So, that's it. I will tell you that I had to get up a moment ago to help Stella (who starts kindergarten in THIRTEEN DAYS...which means that there's basically just enough time to squeeze in a Cuban Missile Crisis before school begins), and when I got up my hip was all stiff. Go ahead and laugh because it's absurd. Happy weekending, peeps. It's good to be back. I have sincerely, truly always believed that everything happens for a reason. From a religious perspective, I suppose I drank the Kool-Aid on the whole "I know the plans I have for you" thing. From a secular perspective, I suppose I'm a fatalist. I don't know why, but it's always been firmly rooted in my psyche. I suppose it helps me deal with things I don't like or particularly understand. I can even come up with reasons. My grandmother passed away a week before my wedding, and I am convinced that it happened because she was too sick to attend my wedding in Memphis, thus she passed away so she could be there in spirit. M's daddy passed away a week before T was born, and I know that he passed when he did because he was too ill to be a part of T's life and because his continuing to be so ill would've kept M from being fully present at the birth of his son and during the first weeks of his life. I deeply believe these things. I believe that every disappointment happens because the true purpose of life is just around the corner and couldn't be realized in any other way. But today, my belief is massively shaken. Many of you have followed Lucy Krull's struggle simply because of that little button on the sidebar of my blog. Others of you, like me, know Kate and Erik. I simply cannot understand why a child, Kate's sweet angel baby, should be put through this. I cannot understand why she'd be made to suffer so much already, only to have it happen again. I cannot understand how this can possibly be part of the plan for Lucy, for Kate or Erik, for Ella, or for Jack, who will likely not remember his beautiful, blonde older sister. So, I can't honestly imagine the gut-wrenching reality that the Krull family is going through right now. I can't fathom being in a place where you sincerely pray for mercy for your child after you've already sent up so many thousands of prayers to save her. I don't generally ask for prayers. I always think it sounds hokey or selfish, and I think it gets overused for the wrong reasons. But I'm asking you to pray or meditate or do whatever you do to communicate with the universe. 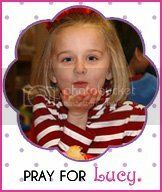 I'm asking you to pray for Lucy and the Krull family. Then spend today being extra thankful for your own blessings because you might not always have them. i am just a poor boy though my story's seldom told. The boxer. Otherwise known as "the boxing turtle." Otherwise known as an Eastern Box Turtle that lives in the wild kingdom. Last week, I took a peek out of one of T's windows to see what I could see. I spotted five different types of birds all at the same time and then I noticed something moving around on the ground that was different. It was a turtle. S and I went promptly outside to investigate our newest neighbor. Then we came inside and did some turtle research. Some days, life is so simple and perfect. ...I will show you what life looks like around here today. While T sleeps, S is watching Ramona and Beezus because she "got sweaty" helping me pick up sticks in the yard. While T sleeps and S watches TV, M is diligently working to remove the stump created by the chopping down of the whomping willow. While T sleeps, S watches TV, and M works his tail off, I made these rock sculptures to inspire him because that's the way art works and I "got sweaty" picking up sticks and raking. While T slept, S watched TV, M worked on giving himself a heat stroke, and I did nothing of any consequence, our mailbox sat out by the road looking shiny and cool with a tree wrapped around it. I love that tree. And there you have it, a lovely Sunday afternoon. S graduated from preschool yesterday, and my only struggle with sentimentality was when I walked her into school. She was perfect and amazing, and I couldn't love her any more if I tried. Before her last day of preschool. Announcing that when she grows up, she'd like to be a princess, a ballerina, a teacher, and a gymnastics owner. Please note she's standing on a pew. She's not quite that tall yet. M, however, is standing on the floor. He is that freakishly tall. Leaving preschool for the last time. Please note the difference between the boys' table and the girls'. Yesterday evening, as M put T to bed, S and I built a couple of new fairy houses. They are awesome, but that's not the point. The point is that when I went to cross the item off of our Spring To-Do list, I realized that the only item left on the list involves her preschool graduation, and for the love of Pete, can someone stop time for a minute so I can catch my breath from all the growing up that's happening around here? S taught herself to snap. She's literally been trying to snap for years. Suddenly, her teeth are falling out and she can snap and I feel like she's going to need a bra or something the next time I turn around. I suppose I'm not that weirded out by the fact that she'll need a bra someday, but when Thad comes to me and tells me he needs a jock strap I will fall over dead. I'd like donations to be sent to a charity in lieu of flowers when that happens. Just so you know. I go to the grocery store on Wednesday nights. I used to go on Thursdays, but a few months ago we ran out of a bunch of stuff a day early, so I went on Wednesday and realized that 72% of the county's population was at church on Wednesday nights, so the place was practically deserted. So much less playing of chicken in the aisles, so much less being annoyed at the ladies who park their carts in the middle of the aisle whilst they peruse the numerous choices of boxed cake mix, so much less waiting for Suzy Q No Decision Maker to choose what flavor of Yoplait she wants this week so that I can grab T's plain yogurt. It was really lovely. I can't bear the thought of going other times now. It's a standing date between me and the Kroger. Every Wednesday night. Last night, for some inexplicable reason, the store was packed. I didn't notice it while shopping, but when it came time to check out, the lines were mighty. I grabbed a magazine from the rack and hunkered down. A mom and teenager got in line behind me. They kept looking in my direction and talking quietly in a way that made me really self conscious. When I started unloading my cart onto the belt, the mom crept up alarmingly close to my cart, peering in. I said, "Oh, I'm sorry, am I in the way?" (In a nice way, not the snarky way it just seemed.) I thought that maybe she needed a Twix. Or a prepaid Visa. It was weird. She looked at me and said, "No. My husband just had open heart surgery. He just came home today. He has to eat healthy, and I don't know what to do, so we were looking in your cart for ideas." I told her that I was sorry about her husband and that she could rifle through my groceries as much as she liked. She proceeded to tell me that her husband wasn't heavy, but that they'd always eaten whatever they wanted and that they'd basically never wanted anything healthy. The woman was totally lost, admitting that pretty much they had always lived off cheeseburgers and pizza. It didn't really add up. This woman looked really fit. Her daughter looked really fit. She even told me that she and her daughter walk every single day together. She told me that they were hauling hay when her husband just fell over. Seven bypasses. Seven. I didn't even know that was possible. She asked me what I do with broccoli because she saw a head of it in my cart and sent her daughter off to the produce section. I told her she could steam it or roast it, and that we like it roasted. Then I told her how I do it. She just started asking things like, "Can he eat tuna fish?" I said that yes, fish would be great but that he probably shouldn't eat tuna salad with a bucket of mayonnaise in it. She saw unsalted butter in my cart and said she'd probably need to get some for his toast. I told her to check with her doctor on that one. The poor woman was overwhelmed. When she sent her daughter off to grab something else, I asked how the daughter (who's name is Lindsay and is 15) was coping. She said she was okay. She was driving the truck her dad was throwing hay into when he collapsed. She was shaky a lot and obviously freaked out. I asked about her. She just said it was completely overwhelming. I desperately wanted to hug this woman. And I wanted to go to her house and roast her some broccoli. I didn't hug her. Frankly, she didn't look like the type that would want a hug. Instead I told her I was giving her a mental hug. I didn't know what to say after all of that. This whole long story is just to remind you that you need to take care of yourselves. And that there are multiple parts of the equation. This was an active guy. A young guy (44). But he ate like he thought his body was a garbage disposal, and his wife mentioned a family history of heart disease. Take care, my peeps. And teach your kids to do the same. Sorry I went missing for a week. I realize you've weathered longer breaks than that, but still. I've been busy with life and slight meltdowns over the pace at which life seems to be moving along. Last Thursday, I jetted up to Albany to snuggle Scarlet Lily's baby E and C. Shrimp and Grits was made and eaten. Mac and cheese was made and eaten. Molly's cake was made and eaten. Wine was consumed. Stories were told. Belly laughs were laughed. And I invented a new color. Before I left on my trip, it was made very obvious that T was about to start walking, and he waited for me to get home on Sunday to start because he loves his Mama, and if he hadn't waited for me then there might not have been adequate snuggles if he fell. It's solid logic. Sunday afternoon, he started taking a couple of steps at a time. Very tentatively, but they were deliberate and they moved him from Point A to Point B. Each day there have been a few more steps added before the inevitable flop onto his bottom. Last night at the tennis courts, he figured out how to stand up without pulling himself up on something stable. He'll be totally over crawling in a matter of days. It's magical to watch, but also a little scary in that "wobbly toddler" way. ...Sidenote: I just got up to check the bread that's baking. Do not poke at a loaf of bread from a 400 degree oven. Also, I have no fingerprints anymore. Anyone who's up for a bit of illicit activity should send me an email. ...back to kindergarten. Registration is just as convoluted as one might expect from a public school system. Don't get me wrong, I have a deep, true love for public education, but when you're publishing a list of required documents for registration, please don't ask me for another document when I get there. If you want me to bring in a utility bill to prove my place of residence, add it to the list of stuff you want me to bring. Hauling a wiggling toddler in and out of an elementary school is not as easy and graceful as I made it look whilst trying to break into said school because I did not see the sign saying you have to be buzzed in and thus yanked on all the doors like I was trying to escape the boogey man for several minutes. In front of a classroom's worth of kids. So, that emotional milestone is not yet met. But we're getting there. Then, to just pile it on with reckless abandon, S approached me with not one, but two, loose teeth this morning. It's like these two children are conspiring to see if they can break me with all the milestones at one time. And you know what? They can. I can't win this fight. I'm a broken woman. And I love every second of it. The seconds just go a little too fast sometimes.